Chance for Nepal shared a post. CHANCE for NEPAL is delighted to be part of the skills training programme with WCS. Empowering women to help their families, their community and in many cases to educate their children from their earnings….a win win win! On my annual visit to Nepal overseeing our projects, I see first-hand on one of the skills training days, just how empowered these women are, all eager to share with me their family circumstances, how much they earn, how many children they educate, what vegetables they grow. I come away feeling uplifted and inspired.Shenpen and Chance for Nepal (UK) are delighted to support our project partner Women’s Cooperative Society (WCS) who conduct skills training for rural women. These training sessions run throughout the year on the outskirts of Kathmandu Valley for women from rural villages. They include elementary and advanced vegetable farming and bakery training. We are delighted to be part of the skills training programme with WCS. Empowering women to help their families, their community and in many cases to educate their children from their earnings….a win win win! CHANCE knows the importance of the weekly food baskets we fund for BVS, giving vital extra calories to aid a speedier recovery. A short video. Chance for Nepal shared an album. CHANCE for NEPAL is keen to support Mountain Heart Nepal’s brilliant work, through funding medicines for the health camps and their relief work in Bara.A medical team consisting of five people from Mountain Heart Nepal conducted health camp at the storm affected Bara on 13 April 2019. The outreach clinic was set up at Mahagadhimai Municipality-7, and Subarna Rural Municipality- 4 (Hardiya) of Bara district. About 250 patients received free health treatment including essential hygiene and personal care products received from Direct Relief. Three-quarters of the cases seen in the camp were related to trauma inflicted by the storm. Nine patients needed a referral to higher center and therefore were transferred to Kathmandu. Chance for Nepal is feeling loved. Now we have it, Nepal's pollution and air quality, the worst in the world! This year will be my 18th year of going to Kathmandu to oversee our projects. The anti rabies vaccinations continue with Sneha's Care. Team Sneha's Care has completed vaccination from ward number 20 from Lalitpur district with a total of 60 dogs being vaccinated today. Parallel to this, the dog census is also ongoing. Till now, more than 1400 dogs have been vaccinated from ward number 1, 2, 10, 11, 7, 8, 9, and 17 of ललितपुर महानगरपालिका कार्यालय, Lalitpur Metropolitan City Office. This vaccination program had a cease when our team went on to rescue cows in Ghodaghodi Municipality. We are very much happy to recommence our program. Rabies, according to the World Health Organisation, causes 59,000 agonizing and painful deaths globally every year, one person every nine minutes, mostly children and the poor. Vaccines help prevent many illnesses that affect dogs. Vaccinating dogs has long been considered one of the easiest ways to help him live a long, healthy life and also to reduce the contagion of these major diseases. We are delighted to fund this brilliant organisation from the start of their rabies vaccination programme which started today in Lalitpur. They do such an amazing job to keep rabies off the streets of Kathmandu. We support Sneha’s Care though Shenpen our partner on the ground.Team Sneha's Care has resumed the Mass Anti-Rabies Vaccination in ललितपुर महानगरपालिका कार्यालय, Lalitpur Metropolitan City Office from today. 50 dogs were vaccinated today from LMC, ward number 20. Parallel to this, the dog census is also ongoing. Till now, more than 1400 dogs have been vaccinated from ward number 1, 2, 10, 11, 7, 8, 9, and 17. This vaccination program had a cease when our team went on to rescue cows in Ghidaghodi Municipality. Chance for Nepal shared a photo. Please help if you can to this brilliant organisation.Team Sneha's Care is putting all its efforts into taking care of the troubled animals in dire need of emergency care. 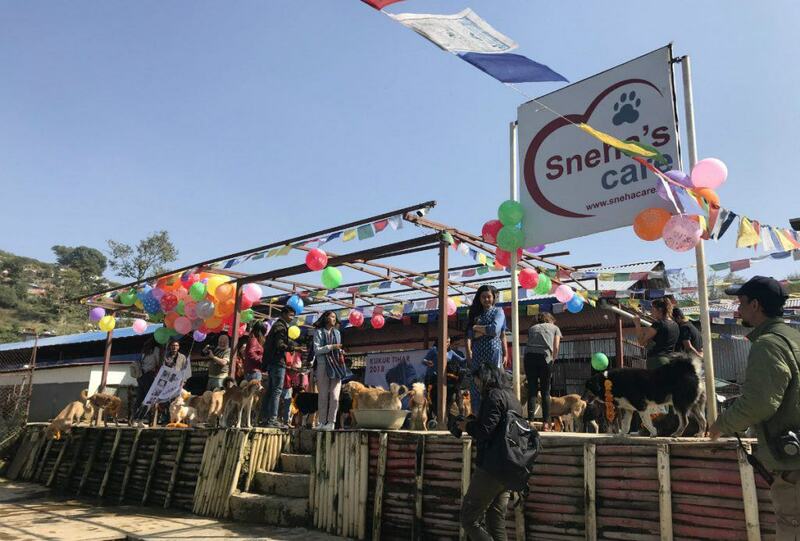 A team of technicians, veterinarians and support staff left Kathmandu with emergency medicines and supplies in an ambulance the following morning, i.e., Monday, and has been extending emergency care for the animals continuously for the third day today. Specifically, the team has been engaged in taking medical care of the injured animals and distributing the relief in the affected areas. 250kg bran has been bought and 50 kg distributed till now for the ox and horse owners. Let us not neglect but protect these animals! Let us all slowly see the effect as the animals reconnect!! Help us to help more animals in need. Bipana is 5 years old and from Nuwakot, which is 75 Kms from Kathmandu. Bipana’s father died of TB and her mother works a small piece of land and looks after Bipana and her 3 year old brother. Their financial situation is dire. Bipana suffered 20% second degree burns to her chest, tummy and bottom. Her mother had put some food to cook on an open fire in their one roomed hut and went out to work in the field, leaving Bipana and her brother alone in the hut to keep warm. Bipana ran and tripped and fell into the open fire and got severely burned. On hearing screaming, a neighbour ran into the hut and saved Bipana and applied coconut oil and tomatoes onto the burn. She was rushed to a local health post and transferred to Trishuli Hospital, but after 7 days, was transferred to the burn’s unit at Kanti Children’s Hospital as her condition was not improving. Tomatoes with their high water content are sometimes used on burns if there is no running water. Sonu, is 11 months old and lives Lalipur, 4 Kms from the Kanti Hospital. Her parents are farmers and are both deaf and dumb, their financial situation is extremely poor. She has a 6 year old sister who is in class 1 at school. Sonu suffered 4% burns to her neck. Her mother was doing chores and had boiled water and put it on the floor to cool. Sonu, learning to walk and unsteady on her feet, fell and hot water went onto her neck from the water in the bowl. She is improving well. His mother had gone to the temple and his father was working the land. Sujil and his sister were playing outside and he decided to climb a tree . There was a live wire amongst the branches which he touched and got an electric shock. He received medical treatment from a health post, but after 5 days, he was brought to the Kanti for specialised treatment. He has had one debridement and 6 dressings. He is recovering well. Pasang is in class 2 at school and is 8 years old and comes from Butwal which lies 270Kms from Kathmandu. His father is a migrant worker and mother a housewife. He suffered 10% 1st degree burns to his left hand. He is in class 2 at school. He came home from school, and whilst his mother went to call her husband to come and eat who was outside Pasang decided to help himself from the pan of hot oil on the stove, some of the oil spilt onto his hand. His mother put perfume onto the wound! and then ice! He was referred to a district hospital near to his home but after two days, was transferred to the burn’s unit at the Kanti Children’s Hospital. It is important never to put ice on a burn, as stops the circulation, but to always use cold running water wherever possible. He has made a good recovery. Thank you to our partner on the ground BVS for sharing. They deliver food hampers weekly to every child on the unit funded by CHANCE, we also fund counselling for the patients and families and physiotherapy. All names changed for protection. There was an article in the Kathmandu Times recently say there is a huge shortage of doctors in Nepal and named the Kanti Children’s Hospital as one of the hospitals in desperate need of doctors and nurses. The Kanti is the only National referral centre for paediatrics care in Nepal. ‘Every day, around 1,000 people visit the hospital seeking treatment. Hospital sources said that there is an acute shortage of manpower and equipment to cater to the children in need of treatment. When the Post reached out to Dr Ganesh Rai, director at Kanti Children Hospital, he appeared to be resigned to the fact that there was nothing he could do. According to Rai, the hospital needs 39 medical officers, 160 nurses and other staff to continue its existing services. Likewise, patients visiting the hospital for ENT and orthopaedic services have been forced to seek services at private hospitals. The hospital withdrew at least 16 ICU beds for the lack of nursing staff. We support this brilliant organisation who are asking for help now. If you can, please support them directly.We need your help! A massive storm hit several places in the southern district of Bara and adjoining Parsa on Sunday evening with the death toll rising above 50 and around 500 injured who are undergoing treatment in hospitals and emergency wards. While rescue efforts are gaining in pace with security personnel and battalions deployed to the affected areas for rescue and relief operations of people, it is saddening to see that animals have been left astray with thousands of animals being either dead, displaced or severely wounded. Team Sneha's Care has reached the destination to rescue and provide medical help to these troubled animals in dire need of emergency care. The time to help is NOW!! We are delighted to support BVS and the burns unit at the Kanti Children’s Hospital by funding these food hampers, now in our 13year! Thank you for sharing the photos.Visit to Kanti Children’s Hospital by our executive board members. Well done Annalise! She has now reached 90% of her target of £1,000 and she has over 8 weeks before she goes. Help Annalise change the world! Make a donation now? We love supporting this programme with Shenpen, now in our third year. By having the 'Tiffin' meal, which is sometimes the first thing the child has eaton that day, increases energy levels, thus, performance and concentration levels increase too, parents are happy, full tummy, so children are happy, win win all round. 🥰 We also have funded educational posters, puzzles, books, and water for the water tank.80 meals in a day. This boy and the little shop he works in offers meals for 80 of the neediest students at Mitra Aadharbhut Vidhalaya. For many of these children, this is their first meal of the day. There were 22 children, mostly below 5 years of age, on the buns unit at the Kanti Children’s Hospital when Anamika went to deliver the Goody Bags which are funded by CHANCE. The ward nearly maximum capacity of 23 beds. Samira is aged 3 and comes from Terathum which is 500kms from Kathmandu and took over 12 hours to reach the hospital. She has a younger brother and lives with her parents. Her mother is staying with her in hospital. The burns to both legs are severe, 1V degree, and she will need surgery. Her mother had boiled water and put to cool on the table and Samaria pulled it over onto her leg. Here she is with one of the knitted teddies in his blue jacket. Ambika is aged 4 years old and from Jhor, on the outskirts of Kathmandu city. She lives with her parents and has 3 brothers and a sister. Her mother was preparing Pakkaudal (made from flour and vegetables) which are deep fried. Her mother had a pan of hot oil ready to fry the Pakkaudal and some of the hot oil spilt onto Ambika. She suffered 10% , 3rd degree burns to her legs. Both very tragic accidents and with the mother present at the time! Thank you for sharing Anamika. Each year I take hundreds of the knitted comfort dolls with me to Nepal. All lovingly knitted and individual. I give Anamika a couple of hundred which are part of the goody bags, along with a toothbrush, children’s stickers, toy, Rubik cube or brick game for the older children, and soft bear for the younger ones, which she hands out on her twice monthly visits. There are many wonderful knitters who enjoy knitting these for the children on the burn’s unit. I also give them out on medical missions, in schools for the nursery classes and wherever I feel it is appropriate and can bring a smile to a child’s face. I always carry some with me in my day bag, when out and about, for whenever an opportunity arises to make a difference. The other day I met a friend, Rose, who I hadn’t seen for over a year, and she told me she was amazed when she saw a photo I had posted a few years ago, where one of the children was holding a doll that she had actually knitted and how touched she was to see this. She had the photo printed and it’s now framed in her living room, how special is that! She sent me the photo below from 5 years ago! I often wonder if my knitters do Facebook and recognize their lovingly made doll! I share the ones Rose knitted which I gave to two little girls outside their school building. Lovely pictures, thanks to all the wonderful ladies who knitted the dolls for our children! We are delighted once again, to support the brilliant organisation GMIN. This being our 3rd school with them, and their 42nd! Peter and Rosie Gent came across our website, and liked what we do and asked to meet up to discuss building a school, and here it is, taking shape and before the monsoon in June/July will be fully operational. The NATIONAL PUB QUIZ at The Keep in Guildford last night raised £305 for CHANCE for NEPAL. Jane and Brian, the landlords have entered CHANCE into the National Pub quiz for the past 4 years. We had 29 players and everyone enjoyed a fun evening. Jane cooked a delicious complementary chicken curry with a vegetarian option and they also provided the raffle prizes, by way of great bottles of red and white wine as well as a Neom gift set, all super generous. My thanks also go to Sydney, behind the bar, always smiling, ever helpful. The money raised from last night’s quiz is being given to SHENPEN, our partner on the ground in Nepal, for their menstrual health programme. This is designed to educate students about hygiene and distribute reusable cotton menstruation pads and information by way of a dignity kit. They are optimistic that the program will change some of the negative cultural beliefs about menstruation in Nepal. Recognising how menstruation affects a girls ability to get an education they are also actively engaging with these girls, promoting positive messages about female-specific issues. To give training and a dignity kit to 30 students costs £300. This programme in skills training is a fine example of empowering women, love it.Happy International Women’s Day to all the amazing Women of the World. The World is a better place because of you! Rangjung Yeshe Shenpen, with the support of Chance for Nepal (UK) stand to benefit from a greater participation of #WomenInfarm.